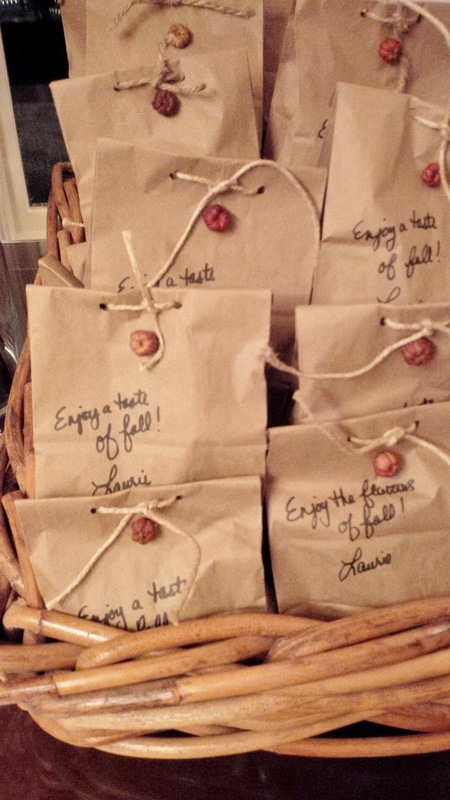 Laurie Loves...: A Thanksgiving Celebration! I love fall! Our October Thanksgiving holiday brings us crisp autumn days, colourful landscapes and the aromas, tastes and sights of harvest – so much to be thankful for! I like to decorate the house and our dining table to celebrate the season, as well as serve delicious autumn dishes. Here's a look at how I put it all together this year. A chalk board sign on a stone bench in the front garden greets guests and sets the scene for the party. We will be enjoying the many flavours of fall. The perfect pumpkins, carefully selected for their beautiful stems, replace summer flowers in urns and provide a warm welcome at the door. 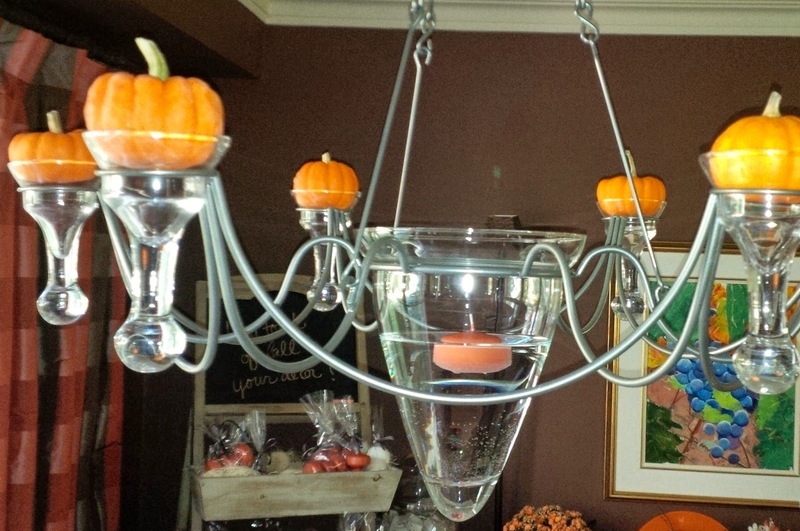 Even the chandelier is adorned with pumpkins! If you are not having a turkey dinner but still want a taste of the bird, why not try turkey crostini appetizers. A french stick sliced thinly, topped with sage, thyme,and rosemary infused butter with a dash of onion salt and then toasted mimics stuffing. Roasted turkey breast from the grocery store - sliced extra thick - is just like the carved meat. And a dollop of cranberry relish finishes the bite sized meal. Layering the table creates a rich and beautiful setting for dinner. A textured woven tray acts as a placemat and is topped with a charger plate and dinner plate. Mini pumpkins nestled in colourful napkins continue the theme. And flowers and leaves from the garden complete the look. Battery operated wax candles create a beautiful glow on the table without the worry of dripping wax. Mini pumpkin pies are a twist on the seasonal favourite. Topped with cinnamon flavoured whipped cream, they are the ideal finish to a fabulous dinner. Friends and family will take home a treat bag with a crisp Cortland apple from a local farm and a handful of caramels reminding everyone of a childhood pleasure - caramel apples. However you choose to celebrate the day, take some time to enjoy the people who make it so special.